MOSCOW, May 5. /TASS/. Russia’s weapons exporter Rosoboronexport (an affiliate of the Rostec Corporation) is prepared to cooperate with its partners in the US on projects that meet Russia’s interests, the company’s press service informed TASS on Friday. 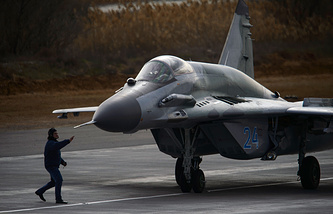 Some media reports earlier said that the blueprint for the 2017 US Federal Budget includes restrictions on any cooperation between the Pentagon and Rosoboronexport, specifying that the US Secretary of Defense may postpone the restrictions, if it is decided at consultations with the US Secretary of State and the Director of National Intelligence that this is in line with the vital interests of US national security. "Rosoboronexport is willing to work with the US within the framework of the projects implemented in the military-technical cooperation sphere, but only if these plans conform to Russia’s interests, that is, after the relevant decisions are made by the president and the government of our country," the press service said.